Art Licensing Editorial: Why some artists are EXTREMELY successful in licensing their art. 1.The increase of competition among artists in getting deals from manufacturers as more artists join the art licensing industry makes it harder to license art. There are now thousands of artists licensing their work while ten years ago there were only hundreds. To compete with other artists in getting deals, artists now need to create loads of art to submit to manufacturers for possible licensing consideration. And, most likely only a small fraction of the art will be licensed. 2. The increase of manufacturers that license art in some product industries such as decorative flags has increased the number of images that is available for consumers to purchase. Thus, the number of each image sold is less, which results in less revenue earned. 3. Even though there are now many Internet retail stores, the number of Mom-and-Pop retail stores has decreased. Mom-and-Pop stores sell a lot of gift products, which is the mainstay in the art licensing industry. Thus, there are now not as many stores that sell products with licensed art on them. 4. In the last eight or so years there has been a change in consumer buying. Consumers constantly ask for new products resulting in shorter product shelf life in retail stores. Because the products are not available as long, less is sold which causes lower revenue earned. Even though it is more difficult to license art there are still artists that do make a living licensing their art. And, there are some artists that not only make a living licensing their art but also earn an EXTREMELY large amount of revenue. WHY??? What do these artists do that makes their art sell more products and earn them more revenue than the majority of artists in the art licensing industry? Below is a discussion on some of the reasons. Note: Only a few artists that are extremely successful in licensing their art are mentioned in this article. There are many more! At the bottom of this post are links to articles about a few of the artists mentioned in this post. Artists including illustrators, carvers, and sculptors that are extremely successful have been licensing their art for many years and are affiliated with many manufacturers that license their art year-after-year. Manufacturers find that their products sell extremely well with these artists art on them. Most but not all of these very successful artists have distinctive art that is very unique and emit an emotional response* that a person can relate to. Jody Bergsma, Mary Engelbreit, Susan Lordi’s "Willow Tree®” brand, Jim Shore’s “Heartwood Creek®”brand, and Suzy Spafford’s "Suzy’s Zoo®, Little Suzy’s Zoo®, Wags And Whiskers®” brands are examples of these artists. Since the art is very recognizable and loved by consumers, it is not surprising that these artists have large followings and their art sells a huge amount of products. * Emotional response when viewing art is when a person thinks that the art is cute, beautiful, clever, humorous, etc. Most of these artist's are so busy creating art that they have hired help to take over the  book work,  make sure contracts are fair, are signed and returned,  track the art that has been submitted for licensing consideration and has been licensed,  make sure that quarterly reports and revenue are received, etc. Some artists (example: Susan Winget) partner with topnotch art licensing agencies that have connections with a large number of manufacturers and are very successful in getting deals for their artists work. Other artists represent themselves or have in-house agents to license their art. And some artists (example: Jody Bergsma) not only represent themselves or have in-house agents but also purchase and sell their art on products made to their specifications. Artists that license their art to manufacturers that have a large distribution earn more than manufacturers that have less because more products are sold. Examples of artists that license their art to these manufacturers are Susan Lordi and Jim Shore. Susan’s spiritual and family sculptures are licensed with Demdaco who manufacture a large variety of products for gifts, home décor, entertaining, fashion, baby, holiday, and outdoors. Jim’s decorative carvings are licensed with Enesco who manufactures a large variety of products for giftware, home and garden décor industries. Through Enesco, Jim also has partnered with Disney, Peanuts, Coca-Cola, Dr. Suess, and The Grinch to create collections of decorative carvings to their specifications. Partnering with these profoundly popular character and corporate brands is VERY lucrative. Another way for artists to increase revenue in licensing art is to partner with retail chain stores like Susan Winget has done. Susan has a Studio Shop with a huge variety of her art on all kinds of products in every one of Jo-Ann Fabric 850+ stores. View the video “Susan Winget Studio Shop in Jo-Anne Fabric & Craft Stores”. Note: Retail chain stores have their own preferred vendors that manufacture products with artist’s art. In 2017, the Walt Disney Company earned $53 billion in global retail sales of licensed products. This includes products and games across Disney Consumer Products and Interactive Media (DCPI), Studio Entertainment, ABC Television and ESPN. Read an inspiring article "How to be a Disney Artist” by artist Rob Kaz. Extremely successful artists market their art and themselves  to gain recognition and build their brand to keep consumers interested in purchasing products with their art on them. There are many ways to gain recognition such as licensing art for products, have a website and blog, advertise in art trade magazines, write press releases, exhibit at trade shows, show art on social media sites (blog, Twitter, Instagram, Facebook, and youtube.com videos ), and participate in demonstrations and artist signings at trade shows and at retail stores . 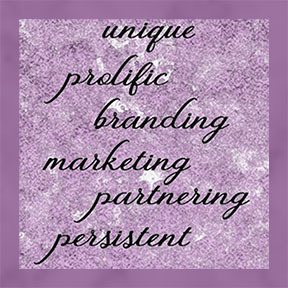 Besides using the staid-and-true methods of marketing art to gain visibility some artists’ market outside-the-box. In other words, they gain visibility by doing something totally unexpected as illustrator Johanna Basford did when she decided that she wanted to license her illustrations for United Kingdom Starbuck cups. Johanna bombarded Starbucks with her art on their cups. Read "Art Licensing: Marketing Art Outside-the-box” about Johanna's amazing journey on how she succeeded in becoming a Starbuck illustrator not for cups but for wallpaper. In the past, it was believed that only art needs to be marketed but now branding experts believe that the best way to optimize brand recognition is to not only market the art but also market the artist. The reason is because consumers feel a connection with a person (artist) and that enhances the wish to purchase products with the artist's art on it. Read marketing expert Linda Mariano’s article “Brand Building with Marketing That Really Counts” to find out how to market yourself. Also read, "Art Licensing: Achieving Brand Recognition - both art & artist”. As an example of using youtube .com to gain recognition, view the video "How to Paint a Hummingbird by Jody Bergsma”. Artist signings are when the manufacturer supply the product with the artist's art on it and the artist signs their name on the product. Extremely successful artists usually have a very unique art style that is easily recognizable. But, not all these artists create art that is so unique that it is “easily” recognizable. For instance, Susan Winget is extremely successful but her art even though recognizable by consumers that follow her is not unique enough to stand out from other artist’s work that has a similar art style. However, that does not prevent these artists from being extremely successful. Artists that are prolific and creates an emotional response with their art like Susan’s has an enormous appeal to consumers. Extremely successful artists license their art to manufacturers that have large distribution of products and thus they earn large revenue. These artists are good at marketing their art and entice consumers to purchase products with their art on them. It takes years to build brands and generate relationships with manufacturers. So artists who wish to become successful in licensing their art needs to work hard and not give up. Examples of artists that have worked very hard and are on their way to becoming extremely successful are Patti Gay and her son Noah’s “Two Can Art” brand, Suzy Toronto “Wacky Women” brand, and watercolor artist Lisa Audit. Patti and Noah’s art is licensed with various manufacturers including Paperproducts Design who is a leading supplier of tabletop paper goods and other home décor products to thousands of upscale retail stores. Suzy has an e-store and licenses her art with various manufacturers including Enesco who sell coffee mugs, photo frames and wall décor with her art on them. Lisa’s art is licensed with various manufacturers including Kay Dee Designs, Counter Art, Certified International, Cala Home, and Legacy. At the 2018 January Atlanta Gift Show, Lisa did signings at all five of these major manufacturers. Note: There are a lot of artist signings at the Atlanta shows but it is unusual for one artist to do that many signings at a show. Below are inspirational articles about a few very successful artists. Illustrator Johanna Basford - "Art Licensing: Illustrator Johanna Basford's Success in Marketing Art Outside-the-box"
Artist Mary Engelbreit - "Art Licensing: Mary Engelbreit's Amazing and Continued Licensing Success!" Artist Susan Winget - "Editorial: An Art Licensing Winning Team: Susan Winget Art Studio"
The following article is mainly aimed at artists new to the art licensing industry and those that are interested in viewing products at the AmericasMart in Atlanta where the Atlanta Gift Shows are held. Artists and art agents are always searching for manufacturers that license art. One way is to attend trade shows where manufacturers sell their products to stores (internet, retail, gift, etc. ), organizations, and more. It is an excellent way to find manufacturers that license art even though not all manufacturers exhibiting at these shows do. Often manufacturer art directors attend the larger shows especially those shows that have permanent showrooms. Thus, those are the shows that most artists and art-licensing agents attend so they can connect with the art directors. The largest gift trade show in the United States is located at the AmericasMart in Atlanta, Georgia. It has two gift and home furnishing shows each year in January and July. The dates for the next shows are July 10 - 16, 2018 and January 8 - 15, 2019. 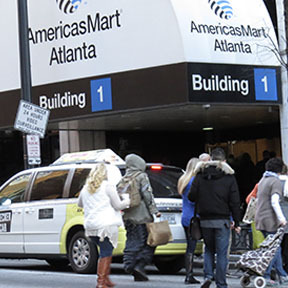 The Mart consists of three buildings with 15, 18, or 23 stories that are accessed by elevators, escalators, stairs, and enclosed walkways from one building to another. It has more than 1400 permanent showrooms and about 2500 temporary booths during a show. Artists and agents that attend the Atlanta show are able to approach companies (manufacturers and distributors*) for contact information, meet with art licensing directors to show art for licensing consideration, get inspiration by looking at all the products, and view what art themes and colors are trending. Because the show is a wholesale trade show for buyers, artists/agents are only allowed to attend if they qualify for the AmericasMarts admission policy. Artists/agents can qualify by being a guest of a company exhibiting at the show**, a guest of a retail buyer attending the show, a buyer if the artist owns a business and qualifies as a buyer, or as press/media (some bloggers have been able to quality). To find out more about qualifying, read “Admission Policy” and “Press Credentials". * A distributor is a company that manufactures hire to promote and sell their products. ** A company that is exhibiting at the show normally is willing to get the artist/agent a badge if she/he has licensed their art with them. The Mart showrooms on most floors have floor-to-ceiling glass windows that showcase an amazing number of “eye-candy” products. A person walking down hallways on the many floors in the Mart can quickly get sensory overload! Below is a list of short videos from the 2015, 2017, and 2018 Atlanta Shows. Numerous products and trends are shown in the videos. Make sure that you check the date the video was published so that you know that the art may not be the latest trend. However, some art is popular year after year and is still very licensable. Not all manufactures in the videos license art. Although, viewing the products is still helpful to spot what is popular for products, art design, texture, and color. • “Gift at AmericasMart” promotion for the 2018 July gift show. Six videos with interviewers Brian Patrick Flynn and Patti Carpenter. 1. "High Design, Gourmet, & On-Trend” Join Brian Patrick Flynn for some favorite picks from the High Design, Gourmet, and On Trend floors at AmericasMart. 2. "Terri Schuver from American Made Collective” Patti Carpenter caught up with Terri Schuver and other artists from American Made Collective to talk about the trend of American-made and about how some artists achieve their unique spin. 3. "Tamra Bryant from Creative Co-Op” Patti Carpenter caught up with Tamra Bryant from Creative Co-Op to talk about the new Pure theme, among other new product trend releases. 4. "Robin Goad with Waterford” Patti Carpenter caught up with Robin Goad from to discuss how millennials can be brought into the high-end table top market. 5. "Michael Brezicky with Kitchen2Table” Patti Carpenter caught up with Michael Brezicky to discuss how millennials can be brought into the high-end table top market. 6. " Ellen Fruchtman from Mud Pie” Patti Carpenter caught up with Ellen Fruchtman from Mud Pie to find out what is going on in terms of experiential engagement to create inspiration for attendees. It is easy to believe that sales at the Atlanta Show were up because holiday retail purchases were up 4.9% and retailers needed to replenish their merchandize. The article “2017 Holiday Retail Spending Up 4.9%” stated that the 2017 holiday season was the largest year-over-year gain since 2011. No wonder Jeffery Portman in the previous paragraph said that the Atlanta Show had a steady pace of buying power and optimum. And, this surge in sales is VERY good news for artists that license their art. Not only will artist's licensing revenue increase as the manufactures sell more products but manufacturers will need more art for their products. Read “2017 Holiday Spending Season to See Strong Growth, Finds ETA and The Strawhecker Group 2017 Holiday Spending Report Card” on the reason for the 2017-spending surge. Last December Pantone Color Institute announced that Ultra Violet is the 2018 Color of the Year. Pantone is a color consulting company that chooses a color each year that symbolizes design trends and cultural mood. According to Pantone, "A dramatically provocative and thoughtful purple shade, PANTONE 18-3838 Ultra Violet communicates originality, ingenuity, and visionary thinking that points us toward the future.” Note: Ultra violet color on products at Atlanta was not prominent. But, since the color was just announced it was too early to see if manufacturers will be selecting art with it for their products. The use of color on products depends upon the art theme and product type. So ultra violet will not be appropriate for all. Atlanta had so many trends at this show that it was hard to keep track of them. Of course, themes that are consistently good sellers for products were on all kinds of products. They include flowers, butterflies, pets, seashells, anchors, roosters, pumpkins, fall leaves, turkeys, Santa Claus, snowmen, pinecones, and much more. The most prevalent theme was words/phrases and quotes on every type of product imaginable. Vintage campers and trucks were also on a large variety of products. The lake theme is increasing in popularity as well as honeybees. The popularity of farm themes is immense. And, flamingos are very popular with the coastal theme. The newest animal that is replacing the popularity of the fox and hedgehog is the Llama. It was on all sorts of products at Atlanta. Note: I kind of "scratched my head" on why a South American animal is so popular in the US even though it is very cute. That was until I read on Wikipedia that Llamas are becoming well known In North America since there are now over 158,000 of them living in the US and Canada. Llamas are used as pack animals in the Rocky Mountain National Park, livestock guards for sheep, and for their wool. Lamas are intelligent and friendly and make good pets IF they are trained not to spit. Another huge trend is the advent of cactus and succulent on products. With the ease of indoor care and the popularity of bringing the outdoors in, it is not surprising that cactus and succulents are popular. Figurines of cactus and succulents as well as wall art, rugs, pillows and tabletop were in many Atlanta showrooms. There was not one trend that seemed to be prevalent in all the showrooms that had Christmas themes except buffalo plaid (see below for the discussion about buffalo plaid). Some showcased Santa’s, or snowmen, or elves, or reindeer, or moose, etc. icons. The large Christmas themed showrooms had vignettes of a variety of individual icons. Below are pictures and discussions on the tends of words/phrases/quotes, buffalo plaid, vintage trucks and campers, animal head art, farm, coastal, nautical, and lake/camping themes seen at the Atlanta Show. At the 2017 Atlanta Gift Show, phrases on plaques and other products was featured in numerous showrooms. And, at this show the phrase only theme (no art) was even more widespread with many new companies exhibiting at Atlanta that sold products with phrases. However, the use of words, phrases and quotes WITH ART was also on every kind of product imaginable as illustrated by all the pictures of manufacturer displays in this article. Note: I received permission to photograph all the displays shown in this article. Hand lettering of words, phrases and quotes is very popular. All kinds of commercial fonts including hand lettering are available on the Internet for sale and some are free. However, even if they are labeled for commercial use that means they can be used in licensing, you should make sure from the seller that they can be legally used in your licensable art. The term commercial use does not necessarily have the same meaning for everyone. The red and black check plaid has been used for blankets and shirts in the US for over 100 years. In the late 1800’s, the Scot "Big Jock MacCluskey" introduced the plaid to America. He bartered his Tartan woven blankets for buffalo pelts from the Sioux and Cheyenne, which they named "buffalo plaid.” Read "Buffalo Plaid’s 100-year-old Mysteries, Finally Solved” for more information on the history of buffalo plaid. Since 1916 when mythological lumberjack Paul Bunyan made his movie debut while wearing a buffalo plaid shirt, buffalo plaid became the symbol of America's rough and rugged wildness. Buffalo plaid is often used as accessories on lodge themed products. In the last couple of years, the buffalo plaid design has been seen on lots of clothing (men and women) and other products such purses, totes, pillows and of course blankets. Last year the use of buffalo plaid escalated and were on all kinds of Christmas decorations and Christmas themed products including wall art, tabletop, pillows, and towels. Note: Although the nickname" buffalo plaid" for the tartan red/black check design was not used at the time, the red/black checked tartan design has been produced for men’s shirts by Woolrich Woolen Mills since approximately 1850. For more information, read "A brief history of buffalo plaid”. Vintage pickup trucks has been slowly appearing on mostly harvest themed gift products in the last few years. However, recently they popped up on numerous themes besides harvest such as Christmas, Halloween, farm, lake, camping, gardening, and anything outdoors. Vintage campers also started slowly for lake and camping themes but at Atlanta they were used on products for many other themes. See the above picture that has fall truck and camper products. One of the most prevalent themes seen at Atlanta was animal heads on various products such as mugs, plates, etc. But it seemed that if an exhibitor had a pillow line the design on the pillows were animal faces. They consisted of wild animals, woodland animals, horses, farm animals, dogs, and llamas. Vintage farm themes on products were also widespread. Many of the products had farm sayings on them such as “Farm Fresh” without art and with art. Chickens, roosters, cows and pigs are the most popular farm theme images. The coastal theme last year was VERY strong. It was not this year as nautical and lake themes took over. Turquoise and coral colors for the coastal theme are still popular. Flamingos are VERY popular but the popularity of mermaids have severely dropped from last year. There were more nautical themed products than coastal at Atlanta. Art with anchors seem to be the stable icon for nautical themes. Blue and red colors on an off-white background were the most prevalent. Lake and camping theme trends are increasing. Phrases related to lakes, rowboats and canoes with wooden docks on water and trees in the background are popular for lake themes. Phrases related to camping, vintage campers, tents, and outdoor cooking are popular for camping themes.